Of roughly 1,200 crop irrigation wells drilled from 2008 to 2012, more than 200 likely are operating without a permit, a Minnesota Public Radio News investigation of public well records found. In addition, nearly 200 others operated without a permit until the past year or so. The lack of permits matters because it clouds the picture the state has of its groundwater and hampers the state's ability to manage what is increasingly seen as a valuable and vulnerable resource. The findings mean tens of millions of gallons of water are likely being pumped without the state's knowledge and that some irrigators are boosting yields and profits while avoiding oversight and, often, fees. • Tell MPR News: What is Minnesota's biggest water challenge? The agency charged with overseeing the permit process and water appropriations generally in Minnesota, the Department of Natural Resources, acknowledges that some users have been getting away without permits. It says it has gotten more aggressive recently, and it asked the Legislature this year for the ability to get tougher. One of the biggest hotspots of the irrigation boom lies in what is called the Bonanza Valley in western Stearns and eastern Pope counties in central Minnesota. It's not hard to see. Standing off Pope County Road 8 near here recently, Department of Natural Resources conservation officer Daniel Baumbarger pointed out the evidence. Four big irrigation rigs stood nearby, each basically a quarter-mile water pipe on wheels. As they swing around a central hub, they trace a perfect circle. 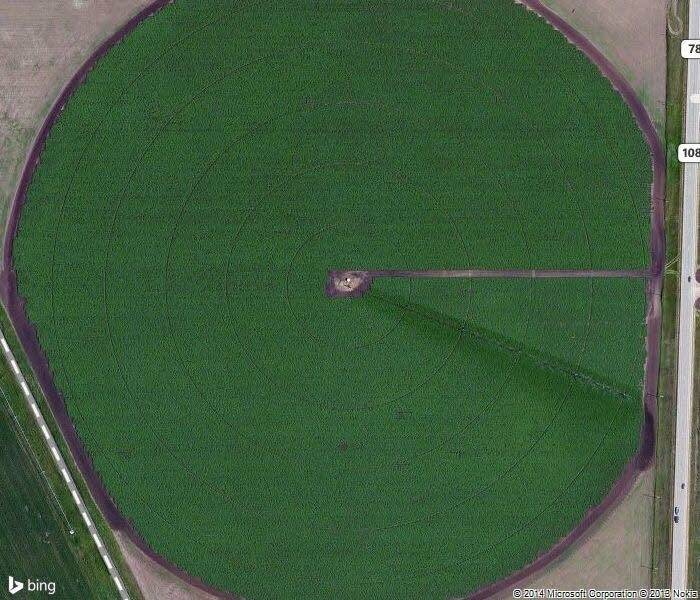 In satellite photos this signature pattern looks like green poker chips tossed on a table. And their numbers are increasing. In 2013 there were more than 400 irrigation permit applications filed with the state. That's more than double the previous year, and four times what was seen in 2011. "Over the past few years, it has increased quite dramatically, the amount of water that people are drawing from the soil," said Baumbarger. Pat Sweeney, Freshwater Society communications director. The state's 5,000-plus irrigation units have pumped as much as 130 billion gallons of water in a single summer, most of it from wells. One main reason: On the state's sandy soils, farmers with irrigation can make more money than those who rely on rain. In drought years that can mean 200 bushels of corn per acre, while unirrigated acres may have less than 50. The difference can be over $100,000 in a single season. An irrigator not only can pay for itself quickly, it can fatten a farmer's bottom line for years. But to get those robust yields, farmers are tapping a public resource. Baumbarger said just as a walleye or whitetail deer belong to the citizens of the state, the state's waters are also public property. "Water is a very big resource that we want to protect," said Baumbarger. 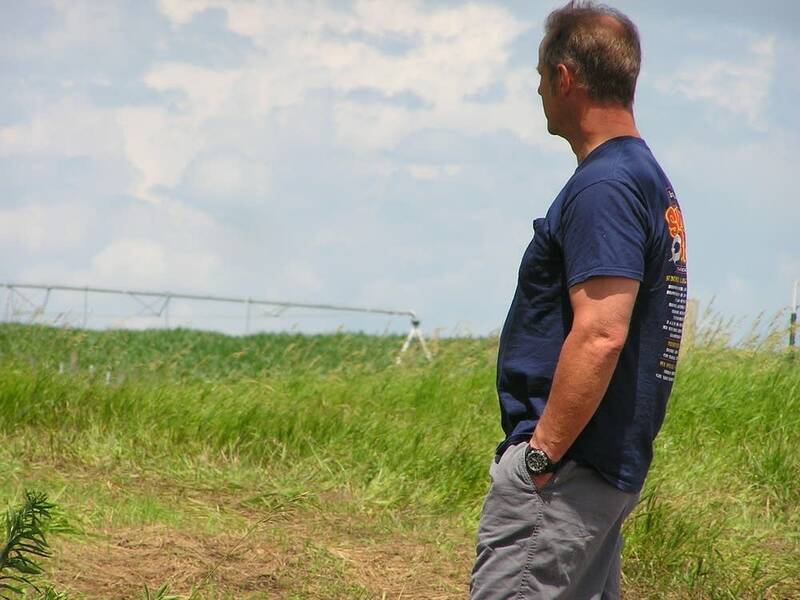 Baumbarger filed misdemeanor citations last summer against Mike Stamer, the Willmar farmer who operates the irrigation units near where the conservation officer was standing. Stamer didn't have a permit for the wells supplying the units. Baumbarger said the DNR sent letters telling him he was pumping public water illegally. Kurt Nelson, whose well dried up after an unpermitted irrigation well went in nearby. "That was the first step," said Baumbarger. "And then once we realized that the individual was not going through the steps needed, that's where I stepped in." He wrote out two $300 fines for Stamer. When the farmer continued to water his crops, Baumbarger issued more citations, eight in all. With court costs, Stamer paid more than $3,000 in penalties. Baumbarger said after the growing season was over Stamer agreed to apply for permits for the wells. But the farmer has several other possible irrigation wells that do not have permits, including one flagged by the DNR. MPR News was unable to reach Stamer for comment. The DNR wouldn't say whether it is investigating further. Each marker on this map represents a high-capacity irrigation well drilled between 2008 and 2012. All of the wells are capable of delivering enough water to require a state permit. Red markers represent irrigation wells without permits. Blue markers represent similar wells that only recently acquired a permit, sometimes years after they were drilled. 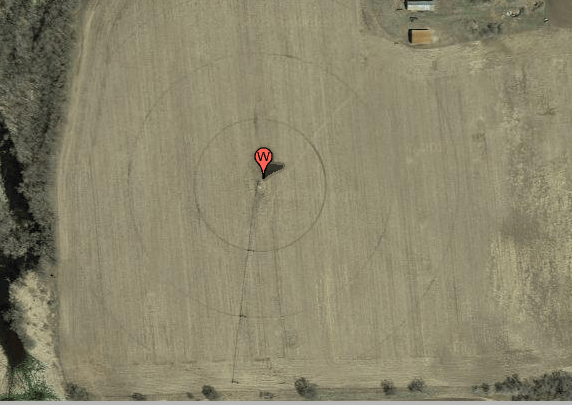 Many wells are located close to irrigator rigs and their signature "crop circles" that can be seen by zooming in on the map. If a blue box is visible, the well location is approximate, but within the blue area. The location information, whether by pinpoint or by quadrant, is detailed in state records. When a well draws either 10,000 gallons a day or one million gallons a year it requires a water permit issued by the Department of Natural Resources. Many of these wells are capable of reaching the 10,000-gallons threshold in a matter of minutes. 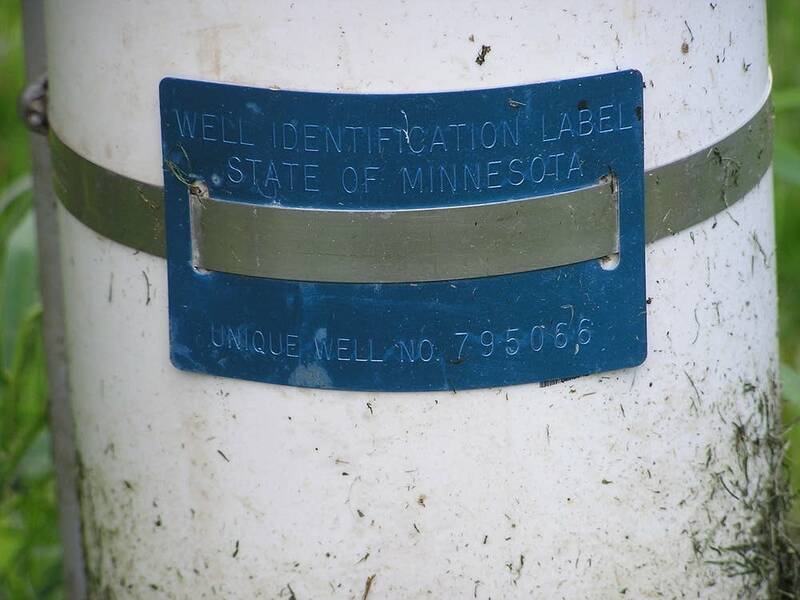 Source: Minnesota Department of Health well and boring records; Minnesota Department of Natural Resources water permits. 1) The diameter of the casing, the conduit that brings water to the surface, is at least 12 inches. 2) The casing diameter is at least 6 inches and state records indicate at least 150 gallons per minute pumping capacity or include a reference to an irrigator. To find out more about the extent of unpermitted irrigation wells, MPR News examined records involving the nearly 1,800 irrigation wells drilled in the state from 2008 to 2012. The companies that do the drilling register each well with the Minnesota Department of Health. Jerry Gruber, Belgrade area farmer. Many of those were relatively small scale, intended for watering lawns or athletics fields and likely below the threshold for requiring a permit from the DNR. Any well pumping more than 10,000 gallons in a single day or a million gallons a year needs a permit. About 1,200 of the wells fit the profile of a crop irrigation well. They had large casings (the conduit that brings water to the surface) generally eight inches or more in diameter and often are expected to pump hundreds of gallons of water per minute. About one third of those had no permit listed in DNR records when MPR News first checked last year. Of those roughly 400 wells, some received permits during 2013, but more than half still do not have permits. The DNR itself has found that many of those irrigation rigs are operating without a valid state permit. The agency said its figures show that, depending on the location, the 'no-permit' rate is between 2 and 20 percent of irrigation wells. Showed the MPR News findings, the DNR raised several possible reasons for the difference in proportion. Steve Colvin, DNR deputy director of the ecological and water resources division. One is that some of the wells may not need a permit, because they don't produce enough water for irrigation. Steve Colvin, deputy director of the DNR ecological and water resources division, said some of the newly permitted wells may have stood idle for several years until they were put to use. But Colvin also said the MPR News list probably contains many irrigation wells that should have permits, but don't. "Some of those are likely folks who have not applied and ought to," said Colvin. The DNR has flagged most of the 200-plus wells that MPR News' work shows are probably operating without a permit. The agency sent notifications to nearly all of the owners, telling them they must get a permit if their well meets the threshold. Colvin says getting all irrigation units into compliance with state law is a major department goal. "The better we can do, the better it is for the environment," said Colvin. MPR News contacted dozens of the farmers whose wells had no permits. Those calls revealed a lot of farmers are not aware of state requirements. One farmer acknowledged he didn't know a state water permit was required until he heard it mentioned in a news story. Many, like Jim Boeckers, who farms near Melrose in central Minnesota, said they support the idea of the state playing some role in regulating irrigation. Clearly eager to follow state rules, Boeckers nonetheless realized one of his wells showed up as unpermitted. That caught his attention, and he promised to check it out. "What I can do is go to the DNR office in Sauk Rapids and talk to them about it," said Boeckers. "You know what, I'll do that." It turned out Boeckers' situation is a common one. He has a state water permit. But when the original well stopped producing, he drilled a new one. He's supposed to update his permit with the new well number, but most likely did not. That is technically a violation of state law, but the fix is simple. The existing permit just needs to be amended. Another central Minnesota farmer, Ronald Pierce, from near Pennock, dug through his files to check his irrigation records when contacted. He found a document that showed where his well paperwork was sent. "The Minnesota Department of Health, is where it went to," said Pierce. The paperwork went to the health department because the well-driller sent it there. The farmer typically gets a copy of the filing, but many farmers wrongly assume that is sufficient and don't realize they need to take the additional step of getting a DNR permit for the well. 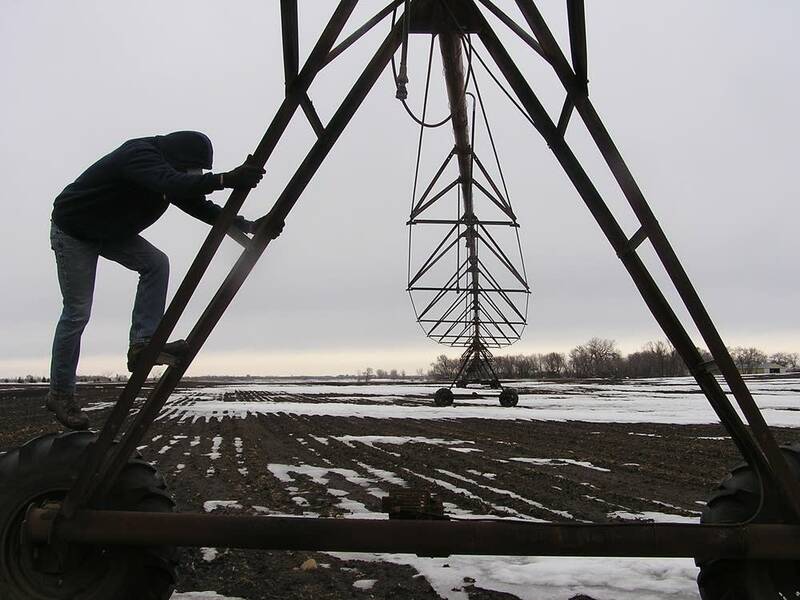 Even an experienced farmer like Jim Anderson, who maintains 50 center-pivot irrigation rigs near Brooten, can slip. Anderson said he understands the need to protect groundwater through regulation but said he overlooked the need to update a permit when he drilled a new replacement well. Two unpermitted wells were managed by the R.D. Offutt Co., a potato grower that is probably the largest irrigator in the state. 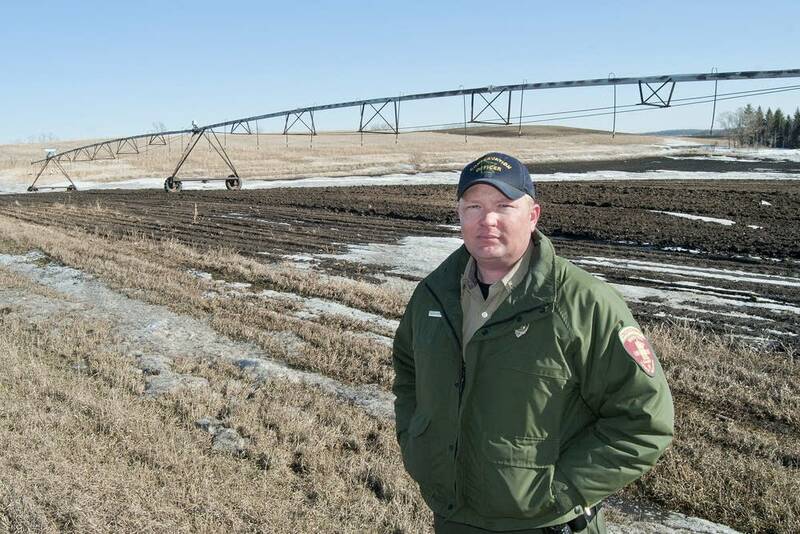 When Robert Kempenich, who manages an Offutt affiliate, checked them, he said in both cases that the company had valid permits for some old wells that irrigated nearby fields. 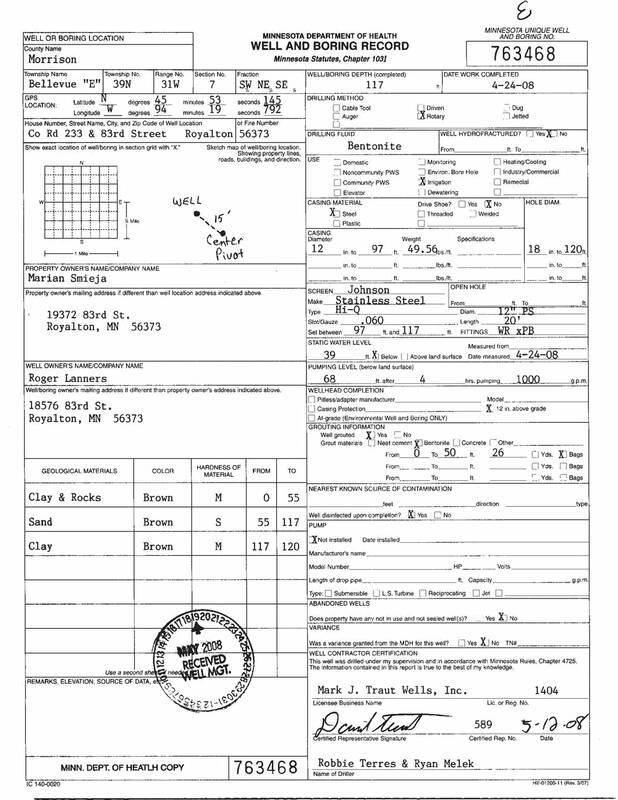 When the company drilled replacement wells in that area, it failed to update those permits with the new well numbers. Kempenich also said that in the process of checking those wells, he found two other permits that needed to be amended "out of several hundred." He said the mistakes were caused by individual farm managers who did not take the steps needed to keep all of the company's water permits up to date. Irrigating without a permit is a misdemeanor, and the state requires farmers to file annual pumping reports. They're also required to pay for the water used -- $140 for up to 50 million gallons a year and additional fees for more. But in order for the system to work, every farmer who irrigates has to participate. DNR policy is to work first with the landowner to try to gain compliance. Kurt Nelson, who lives near Glenwood west of St. Cloud, has experienced the impact of an unpermitted well at a more human level. A year and a half ago the well at his former residence went dry right after an unpermitted irrigation unit went in on a nearby field and, he thinks, depleted his aquifer. It cost him more than $8,000 to have a new well drilled, and he came out of retirement to pay for it. The owner of the land where the irrigation rig was located, Lee Olson of Minneapolis suburb Plymouth, could not be reached for comment. When Nelson filed a formal "well interference" complaint with the DNR, the agency investigated and their initial findings ruled Nelson's complaint invalid. But the agency did not evaluate the effects of the unpermitted well, which was closer than any of the wells the department did evaluate. State records show Olson eventually did get a permit, but too late to help Nelson. The DNR said the case was not yet closed and cited "new information" as the reason. "Man has a wonderful track record of wrecking stuff, and a horrible one at fixing it," said Nelson. "And if we do that to water we're really in trouble." Nelson lives in the Bonanza Valley in west central Minnesota, where sandy, well-drained soil and ready access to aquifers has encouraged irrigation. "Every available inch out here is getting plowed up," said Nelson, a former DNR conservation officer. "The only way you can raise crops on this sandy stuff, even on a normal year, is to irrigate it." It's not hard to determine the intense motivation for irrigation. Jerry Gruber farms near Belgrade in the Bonanza Valley and has seen first-hand the difference irrigation makes. Last summer was another dry one on his farm but on his irrigated land, he harvested 210 to 240 bushels of corn per acre, about as good as any farmer in the state can hope to raise. On unirrigated land, the harvest was a sixth of that, closer to 35 bushels an acre. A typical 1,300-foot irrigation rig covers about 120 acres. Without irrigation, that much land yielding 35 bushels per acre would bring in about $23,000 in a year, using the average 2008-2012 price of corn, $5.40 per bushel. With irrigation, the land would generate well over $100,000. That, in turn, increases the market price of irrigated land, at least hundreds of dollars per acre higher than fields without irrigation. "We wouldn't survive" without irrigation, Gruber said. 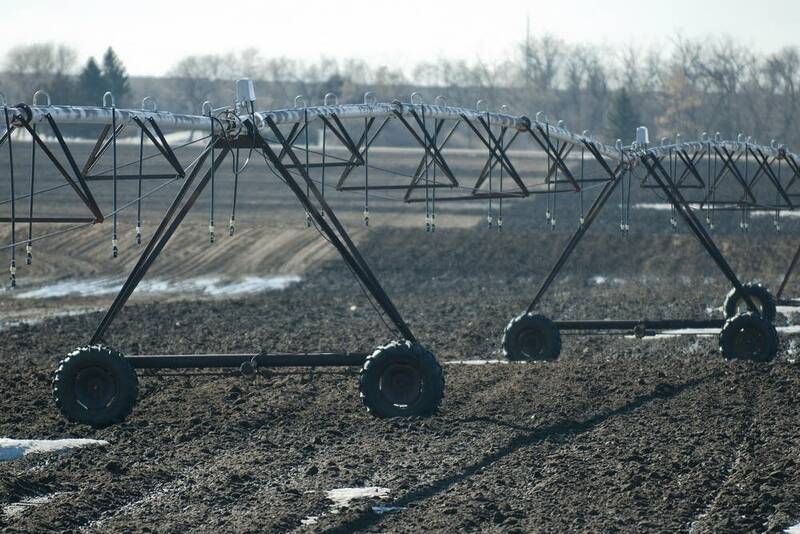 Gruber said farmers have become more efficient with their irrigation units. He says he thinks he's reduced the water he puts on his fields by as much as 40 percent in the past five years of so. The main thing he's done is drop the water closer to the ground to reduce evaporation. But he said some farmers still waste too much water. It's not uncommon to see irrigation units running almost continuously at times, even after it rains, he said. "Some of these guys just don't want to shut their wells off and it's going to hurt all of us in the long run." Recent history has made clear that groundwater is finite. A sharp drop in the level of White Bear Lake in the Twin Cities in recent years brought Minnesota groundwater concerns to the attention of many for the first time. Like a plug pulled out of a bathtub, it's believed the lake is leaking into overpumped, shrinking aquifers below. 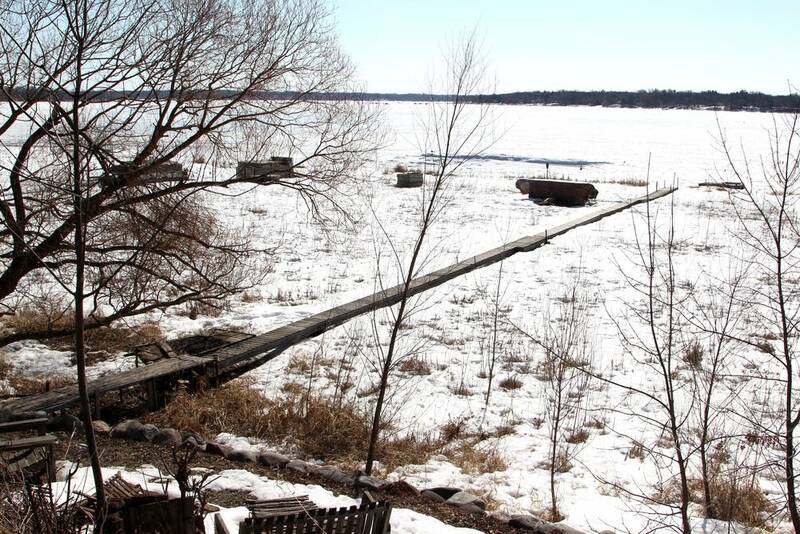 Even though farm irrigation didn't cause the drop in White Bear Lake, the situation demonstrates that unbridled use of groundwater can damage the state's seemingly unlimited water sources. Pat Sweeney, communications director for the Freshwater Society says the irrigation increase could cause similar events in the agricultural parts of Minnesota. "In some areas of the state, either we're already pumping at a level that's unsustainable, or we may be approaching that level," said Sweeney. Last year the Freshwater Society did a study similar to MPR News'. The group found that more than a quarter of the irrigation wells put in between 2000 and 2010 may be operating without a permit. Sweeney said he felt one reason for the relatively high unpermitted rate was a too-weak DNR enforcement effort. "The DNR, at that time at least, was not doing an aggressive enough job of demanding that they get the permits that were required by law," said Sweeney. The DNR's Colvin says the DNR has done the best it could over the years with the resources it had. He says recently enforcement funding has increased. That's provided money and staff for a more aggressive push. For example, over the past two years the DNR has examined more than a thousand aerial photos showing the distinctive crop circles of irrigation units. Colvin says any landowner who doesn't have a permit for nearby wells gets a letter. "The majority of those contacted subsequently applied for permits," said Colvin. Colvin says those efforts have yielded at least another 140 irrigation permits statewide. The DNR wants more enforcement tools, but the Legislature has not approved them. Probably the most important would allow the agency to assess tens of thousands of dollars in administrative penalties against irrigators who don't follow the law. With this tool a typical approach would be to assess violators a financial penalty and require that they take steps to comply with the law. Similar to the process for agencies dealing with water pollution, it would streamline regulatory action, since the agency wouldn't have to go to through a court. Editor's note: Several months after this report was published the Minnesota DNR made public its denial of Kurt Nelson's well interference claim. The agency said testing data indicate the unpermitted irrigation well was too far away to affect Nelson's household well. The DNR did not provide an alternate explanation for Nelson's well running dry beyond "climate and water use."